Chasing you is so much fun. Seven years have passed since novelist Beth Rider escaped the clutches of Jack Dawn and his ilk. She and Michael Stone find that the war rages on as a Rakum remnant begins to rebuild under the thumb of a tyrannical and unbalanced Elder. Determined to destroy everything Beth stands for, Elder Rufus initiates a deadly plan to draw her and her allies into his trap. With the aid of a disaffected Elder named Canaan and a mysterious, legendary Rakum youth known as The Last, the ‘Rabbit Army’ will confront the demonic forces behind those who threaten their freedom and their very lives. 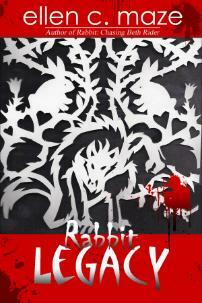 In the battle between good and evil, the gray area expands as Beth longs to bring an end to the Rabbit Legacy.